The Esri SIG User Conference, will be held in Mexico City from August 31 to September 2, 2016. GIS managers, corporate administrators and students will attend the event to network and learn from their community about the value that GIS brings to their industries. This year’s keynote speaker is Carlos Salmán González. Salmán has spent nearly 45 years developing mapping projects in Mexico and abroad. 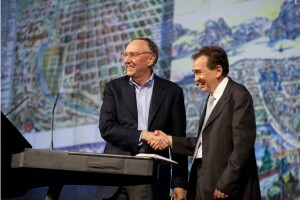 He is the recipient of the Esri Lifetime Achievement award for his exceptional applications of geographic technology. “GIS provides the enlightenment and awareness necessary to stimulate the urgent changes needed in Mexico so that its citizens can realize their full potential,” Salmán said. 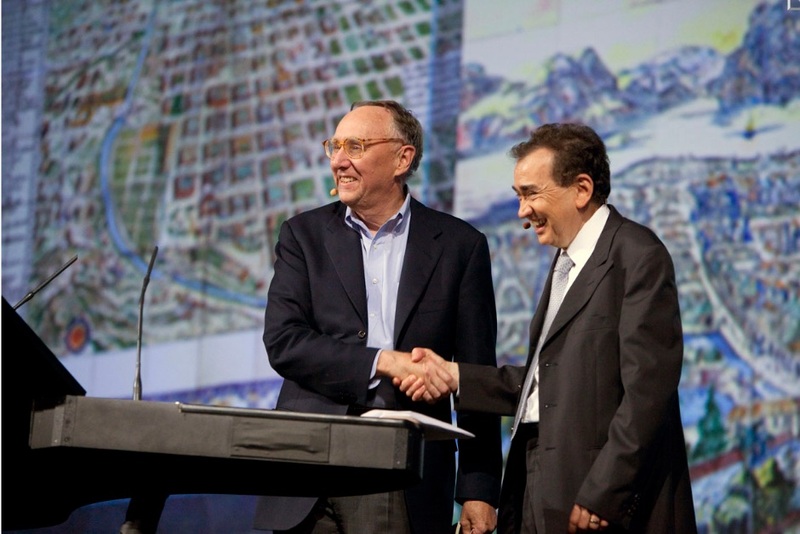 2016 Mexico Esri UC keynote speaker Carlos Salmán González received the Esri Lifetime Achievement Award from Esri president Jack Dangermond in 2010. Salmán began his career in 1971 as a photo-grammetrist with the Commission for Studies of the National Territory (CETENAL), a Mexican government agency. In 1974, Salmán was awarded a scholarship to the International Training Centre for Aerial Survey (ITC) in the Netherlands, where he completed a postgraduate degree in photogrammetry. Salmán returned to Mexico in 1975 to head the photogrammetry department at CETENAL. Later, CETENAL suspended the production of the country’s National Inventory of Natural Resources project, arguing that it was not cost-effective to continue collecting the information at a national level. Recognizing the immense value of the inventory, Salmán mounted an unsuccessful campaign to continue the project. Because of his belief in the importance of maintaining a national resources inventory for the country’s economic sustainability, he left CETENAL in 1980, to form Sistemas de Información Geográfica, S.A. (SIGSA) to provide those mapping services he felt were of national importance. SIGSA’s Mexico Project develops national maps using ArcGIS technology at varying scales, from 1:1,000 in urban areas to 1:20,000 in rural regions, which are used for a variety of projects and studies. Other speakers will include representatives from government institutions, the SIAP (Service Agrifood and Fisheries Information), and ASEA (Industrial Safety Agency and Environment Protection) who will share the ways they apply GIS to benefit their organizations. During the conference, GIS professionals will present more than 60 papers that will touch nearly every industry. Attendees will learn about imagery, 3D visualizations, web applications, and other Esri technologies that will help them make more informed decisions and improve efficiency. Esri will also have GIS experts on hand to answer questions and help company’s advance their GIS strategies and add value to their organizations.